The direction button controls whether the information will be copied from JIRA to MS Project or in the reverse direction during synchronisation. When new issues are created or existing issues are imported into MS Project, the state of the button is ignored. The right-hand side of the section defines which MS Project field JIRA Assignee is mapped to. With the default settings captured in the above screenshot, JIRA issues get assigned to the users with names that match the names of the linked task resources. This way of mapping JIRA users is the most straight-forward but has two disadvantages - there may be multiple users with the same name, and looking up a user in JIRA by his or her name takes additional time, which slows synchronisation. JIRA users can be mapped to MS Project resources using an intermediate resource field that stores Usernames (for JIRA Server) or Account Ids for JIRA Cloud) for the linked JIRA users. To implement the mapping do the following. Select 'Account Id' or 'Username' on the JIRA side, tick the 'Resource Field' option and select a Resource field for JIRA logins or ids. Please note that it is not a task field but a resource field available, for instance, in the Resource Sheet view. Now you can import some resources from JIRA, and that will automatically link them to the source JIRA users. Select 'JIRA > Import Users' in the menu, then enter search text, select the users to be imported and press 'Import'. Open the Resource Sheet view and add the Text10 column. 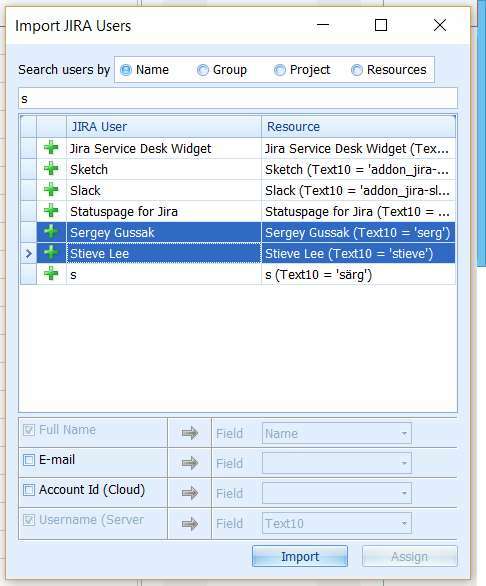 For each resource Text10 is populated with the login of the linked JIRA user. If you try to synchronise tasks now, Ceptah Bridge will know which MS Project resources and JIRA users match. The same approach can be used in the Time Tracking section for the work log mappings. The Text10 field can be populated manually for existing resources without using the User import feature. Assignee can also be mapped to a task field. In this case, the field will contain the value of the mapped user property, and Assignee will not be linked to resources in any way. The 'Do not create issue if no assignee' option controls whether the unlinked tasks that have their Resources field blank are ignored during synchronisation. Untick it if you want all the tasks to be published in JIRA regardless of whether they are allocated to somebody or not.